Home / Inspirational / Bride’s Proposal: Thoughtful Ways to Pop the Question! Women also contribute their fair share of proposal ideas… but without putting a ring on it. All brides need a group of best friends, be it be for moral support or for planning the wedding itself. Brides also need actual assistance while going through the motions. Be it having someone to wipe away the tears before the mascara runs, or in most cases, needing someone to pick up the trail before the bride dunks it in the toilet! One thing brides-to-be often wonder is how they go about their proposal of asking someone to be their maid of honour or bridesmaid. Perhaps, a beautiful gesture such as a piece of lavish jewellery or an exquisite weekend away is a bit out of your budget. Having your budget constantly being drained for all the other wedding necessities is already challenging. So how will you pop the question when none of your ideas seems to be fancy enough? Don’t you worry! You have oodles of ideas and advice right at your fingertips! Get your glue sticks, coloured paper, and stickers out. Have a go at making your own cards. You can shop at your usual stores like Shiploads, The Reject Shop, Officeworks, Spotlight. Balloons aren’t always for birthday parties and children’s amusement. If you put your mind to it, you can create cute little projects that will blow your girls away! Below are a couple of DIY ideas. One consists of a helium balloon filled with sparkles and glitter which is sure to spark their interest! The other is a generic home-brand balloon with a special note inside. It’s a great way to ‘pop the question’ literally! For instance, an emergency kit is more of a practical idea. Filling a little bag or box with all the girly necessities might just save some big inconveniences for your girls! For some inspiration, you could add: band-aids, hair bands, a baby hair comb, a small bottle of hairspray, lip balm, some cotton and a needle, a nail file, a little mirror, some tissues, bobby pins, or earring backs. Any “just-in-case” things you can think of that your girls might need in case of an emergency. Giving them one of these kits may show that you’d appreciate them to care for your special day just as you do. It’s a thoughtful gesture they’re bound to appreciate! A little childish gift never goes astray. Grasping the last remnants of your childhood is always a fun way to celebrate your next step into adult life. You can be creative by choosing the tattoo that suits best for each of your girl’s role in your wedding. In the same way, marking your bridal party with personalised temporary tattoos would make everyone feel connected and important as a group. Supposing you want a straightforward proposal by inviting your girls to a bridal party, you can add some twists to it. In particular, making use of a preparation kit would be great; your girls would feel involved in your wedding plans. Perhaps, including some paint or fabric swatches would help them understand the theme of your wedding. Much less, letting them know the dates of cake tastings or salon visits by the use of DIY cards will give them something to look forward to. You could even place a specific nail polish inside for each of them to wear. It will serve as an assurance for you that everyone will match. Browsing online apps like eBay, Wish, Amazon, Ali Express, or Etsy is a good and cheap way of finding wine glasses or champagne flutes. You can customize these items to receive a set of personalised glasses for each person in your party. This way, you can use your glasses for a refreshing beverage on the morning of your wedding! Your gift will have a purpose. It’s classy and special to the receiver because it has their name on it. Here we have an idea that is pleasing to more than just the eyes. A candle with a charming note or label attached to it is not just pretty to look at. It also provides a beautiful fragrance for your girls to remind them of how lucky they are to be a part of your wedding. You can just about buy candles from any gift shop and attach your own small personal note to them. It’s an inexpensive way to show your love. This is a great idea, especially if your wedding planning just happens to be in the wintery months of the year. You can send or give your bridesmaids a cute mug for them to use and to cosy up in front of the heater. All your mug-loving friends will adore it and with no doubt say yes to your proposal! And if your wedding planning isn’t in the cold season, you can always get plant succulents in mugs as an adorable DIY gift. Similar to the preparation kit, this goodie bag idea can include all sorts of soothing products for your girls to enjoy. A nice lip balm, some bath salts, a moisturiser, and a body scrub. You can also add a bath-bomb, a face mask, hair serum, and some hand/face cream. These are a few gorgeous offerings to sway your besties into being your bridesmaid or maid of honour! Treat your recipients by baking your own homemade cookies and getting creative with decorations. It would be a delightful way to create a luscious gift for your loved ones. You could even hire a professional to make them for you if you are wanting a fancy design or just don’t have the knack of cooking. What better way to persuade your favourite people than sharing delicious delicacies in honour of your wedding day? A bit cliché, but this is an endearing way to ask your special question. The excitement of opening a surprise message would surely get the “yes!” you’ve been waiting for! Jazz up your proposals by using these joyful little activities! You could either make or buy these depending on your craft skill. Also, printing out a puzzle and sticking it onto the card to cut out might be a simple way to make these precious puzzles. Bring back the old trend every child in Australia was a part. You can propose to your bridesmaids with those mouth-watering ring-pops we all know and love! You can make your own box and attach your lolly with a nice-looking piece of lace and you’ll have your proposal all ready to go! If you’re not too keen on the idea of candles, there is always another option! Reed diffusers are incredibly popular and make a lovely addition to households. These are great for gifts any time of year. But if you purchase a personalised diffuser, it can be viewed as something special as it gives a friendly feel to your prezzie. Last but not least, here is the heartfelt box of friendship. This kind gift is bound to reach the hearts of your best friends! By adding a touch of warmth and some personal items, you can create a boxful of memories. These items can include a photo of you and your friend, something from your childhood that is special to you both; her favorite snack (maybe a chocolate); and some other little goodies you know she’ll love in a box. Now that you’ve given your sweet “Yes!” to your man, it’s your time to make your way to your girls’ heart. 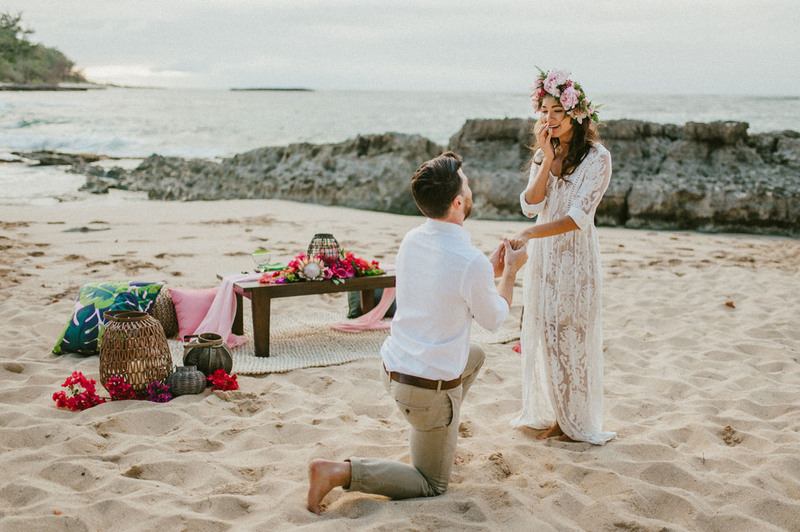 You can never run out of good ideas for your bridal proposal with these tips. We hope that you’ll be able to successfully carry out that heart-warming idea for your favourite people. Good luck!